Hi Everybody! 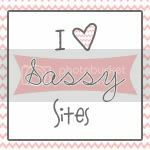 I'm Katie from Running With A Glue Gun and I'm so happy to be guest blogging at Sassy Sites. Two of my favorite things in life are ice cream and Easter. So today I'm going to share with you guys, how to make a small Easter basket out of an old ice cream container. Step 2: Then take your scrapbooking paper and ribbon and decorate your little container. All I did was glue some scrapbooking paper to my container then, hot glued a little bow on top. Step 3: Now take your craft knife and make two slits on each side of your container. Step 4: Now cut a strip of scrapbooking paper and with your hole punch, punch two holes on each end of your strip of paper. Then take your brad and feed it through the hole in your strip of paper and the silt in your container. Fill with goodies and that's it! Super easy and WAY cute! some candy and your little basket is complete! or visit her ETSY shop! This is so cute. My daughter will love this basket. Thanks for the idea. Making this for my little girls birthday giveaways. Thank you so much for giving me an idea. Great post. I love these DIY. I'll be making this for the kids.